Roulston's Pharmacy would like to wish all our customers a warm and safe holiday season and a happy new year! Available every month at our Simcoe Mall location and every other month at our Port Dover location. In Port Dover, Call 519-583-2100 ext. 1. View our Holiday 2010 Flyer Here! Over the past 6 months, our Downtown Simcoe, Simcoe Mall and Port Dover locations have been fully renovated. We are currently completing work on our Downtown location’s dispensary which is expected to be completed within a couple weeks. Our front stores now feature new shelving and display units, new signage, the addition of new coolers offering a selection of milk and dairy products, modernized Health and Beauty departments, expanded Home Health Care departments, Hallmark Cards and expanded Herbal and Natural Products sections. Our dispensaries have also been transformed to better serve the needs of our customers. In addition to a new look, improvements to our dispensaries include the addition of private counseling rooms used for Meds Check reviews and diabetes care, the addition of an automated telephone and website refill ordering system, a paging system when prescriptions are being filled, and much more! Although our look may be new, the high quality service our customers receive remains the same. Please visit one of our newly renovated locations soon! Roulston’s now has a new telephone system which allows our customers to refill precriptions easily, at any time of day! Simply dial your favourite Roulston’s location, push "1” and then "1” again. Once you enter your prescription numbers, you can be rest assured that your prescriptions will be ready when you arrive at the store! If you need to speak to one of our staff, we are still available to assist you with your needs. Roulston’s has now improved its on-line refill service. From anywhere on our site, simply click on "Re-order Refills” and you can easily order your refills on-line, 24 hours a day. It is that easy! Give it a try! To allow you to shop within our stores and within the Simcoe Mall (mall customers), you will be given the option of taking a "Rx Ready Pager” when you come in for prescriptions. Finish your shopping and errands while your prescriptions are prepared! 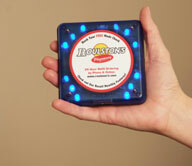 Your pager will buzz when your prescription is ready. This system also helps us to maintain confidentiality as you pick up your prescription. Maintaining your privacy is important to us. Ask about this when you come in for a prescription! Opening in Delhi - Spring 2010! Roulston’s decision to expand into Delhi has resulted from opportunities created by the company’s recent hiring of several outstanding professionals, and its’ 2009 signing with the I.D.A. banner. Both of these developments contributed greatly to the owner’s decision to open a fourth location. Due to new professionals joining the company, a committed Roulston’s pharmacy team will now be able to fulfill the needs of Delhi customers, and collaborate with Delhi’s team of community care providers. After the transition to the I.D.A. banner, customers responded favourably, as there was an expanded product selection, and the personal service and level of care that have been a Roulston’s tradition since its inception in 1933. Positive customer reaction, both to the new product lines and the recently completed store renovations, led the ownership to consider a store serving the western portion of Norfolk County. The new location of Roulston’s I.D.A. Pharmacy Delhi will be at Canada Trust Square, at the corner of King and Main Streets. This location will offer many conveniences to our customers. Patients and customers at our Delhi location will be pleased with the ample parking available to them, as well as our proximity to the Delhi Community Health Centre. Customers will also have access to many Rexall Brand products, Hallmark cards, vitamins and herbal supplements, health and beauty essentials, and other everyday items. Roulston’s continuing commitment to high standards will lead to a positive reception from the residents of Delhi. Part of our company commitment is to make a difference in the communities we serve, and we look forward to making a difference in Delhi. Customers at the Delhi location of Roulston’s Pharmacy will be able to take advantage of savings provided by the I.D.A. flyer program, which will continue to be circulated through the Delhi News Record. Renovations at the store will take place over the coming months, with an expected opening date of May, 2010.